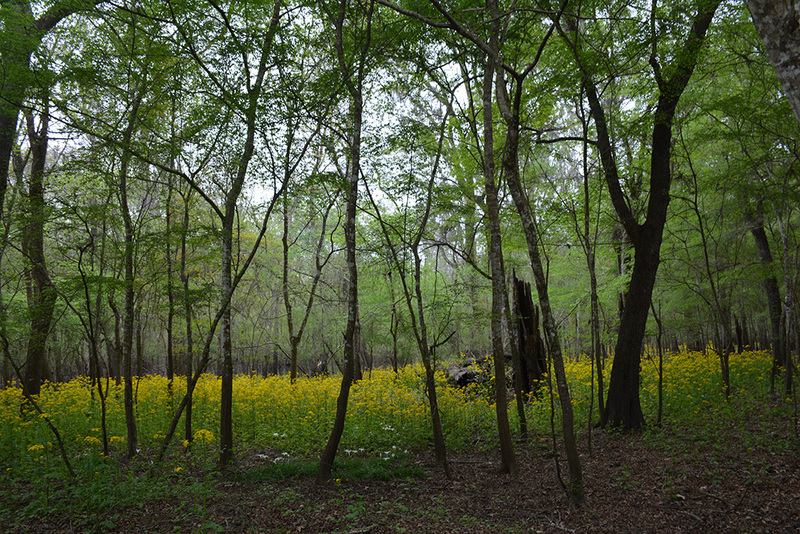 Spring comes early to the banks of the Suwannee River, a crescendo of colors as wildflowers strut their stuff in the floodplains and on the river banks. We’ve had a wet winter, and it’s been unseasonable warm this month, so it’s no surprise that the show is better than ever. Log Landing is one of those places that isn’t on most people’s radar. It’s a conservation area managed by the Suwannee River Water Management District, spanning both sides of the river south of Bell. 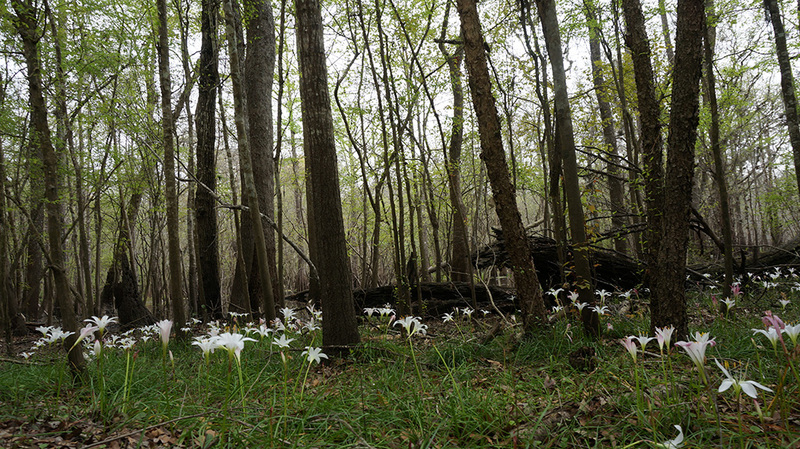 Since it protects the largest remnant of old-growth floodplain forest remaining along the Suwannee River – more than 1,110 acres – it’s no wonder that Log Landing is a land of botanical beauty. 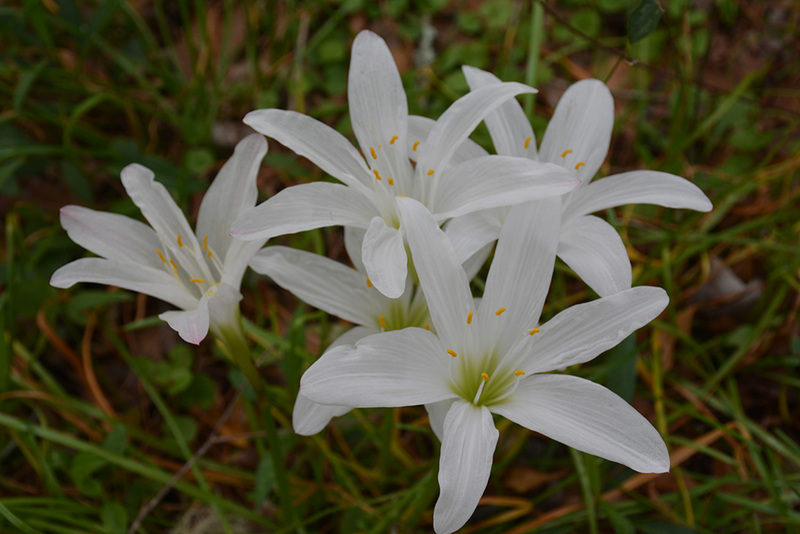 We hadn’t even gotten to the trailhead yet when this stunning display of atamasco lilies – also known as rain lilies, or Zephyranthes atamasca – caught our eye. Time to stop the car and take a wander along Log Landing Road to enjoy this herald of spring. The atamasco lily is usually the first showy wildflower to bloom in South Florida, and it’s always seen around the Suwannee River. But never before have we seen such spectacular numbers of them. 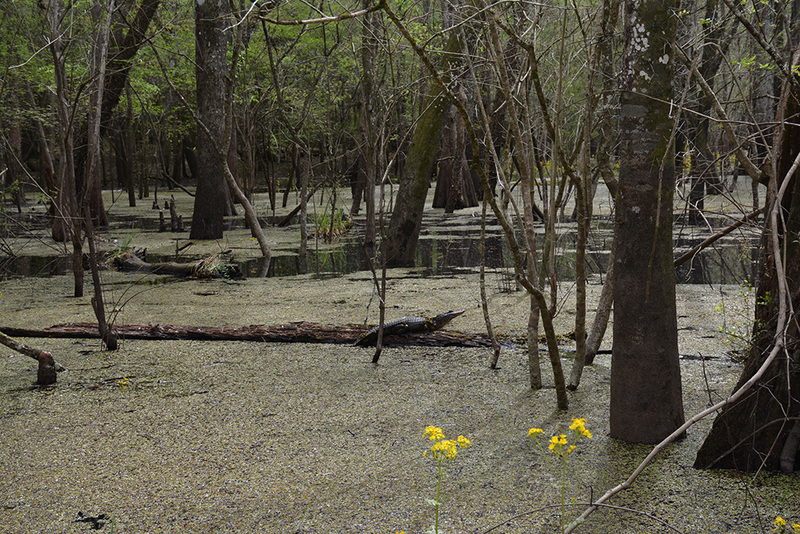 Driving very slowly down the road through the surrounding swamps, we saw a few young alligators soaking up the sun. Once the needles fill in on the cypress trees, they’ll have to look elsewhere for warmth. Log Landing Road ends at a trailhead parking area, but there are no designated trails. 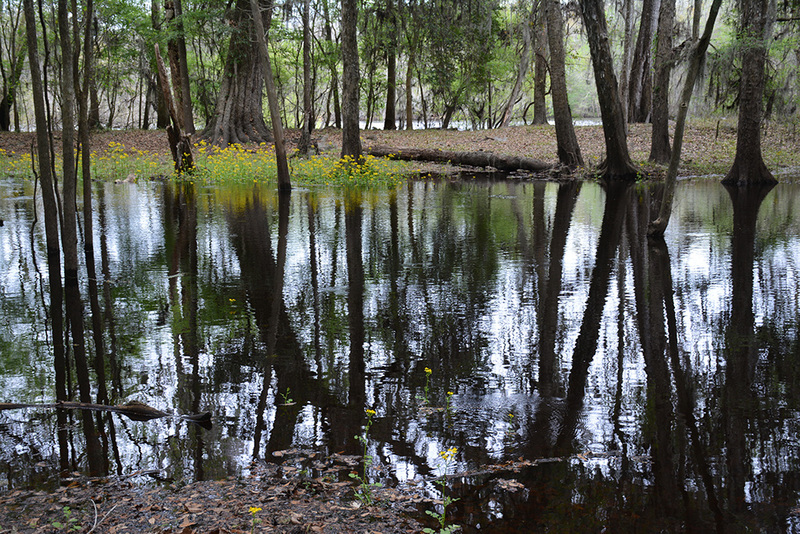 A well-beaten footpath slips beneath ancient oaks to lead to the Suwannee River. As the river was well over its banks during our visit, a flowing side channel prevented us from getting to the riverbank, where anglers can drop a line. Walking the unmarked forest road south, I was surrounded in a blanket of spring green, new growth sprouting from the young trees in the understory. 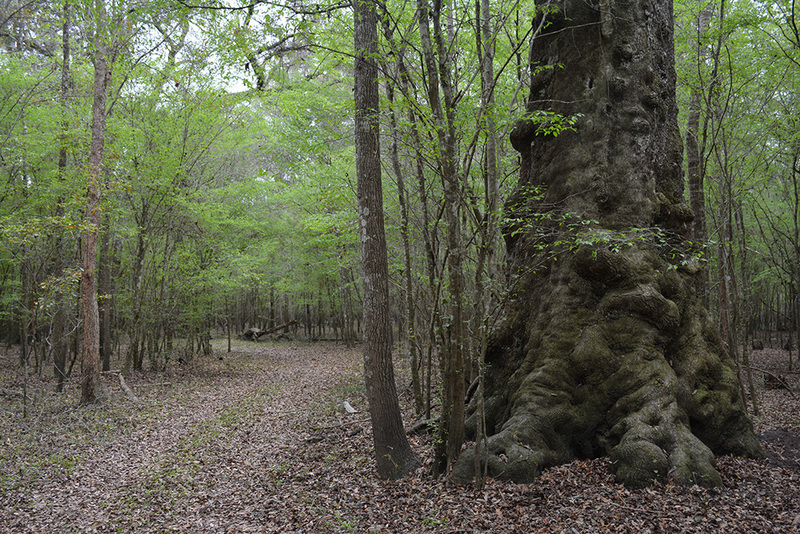 Towering above were true giants of trees: ancient oaks, tupelo, and hickory. Lilies sprouted at their feet. Log Landing hugs the west bank of the river in Dixie County, just downstream from Gornto Springs, a county park with a campground along the Suwannee River and a swimming hole when the water’s clear. 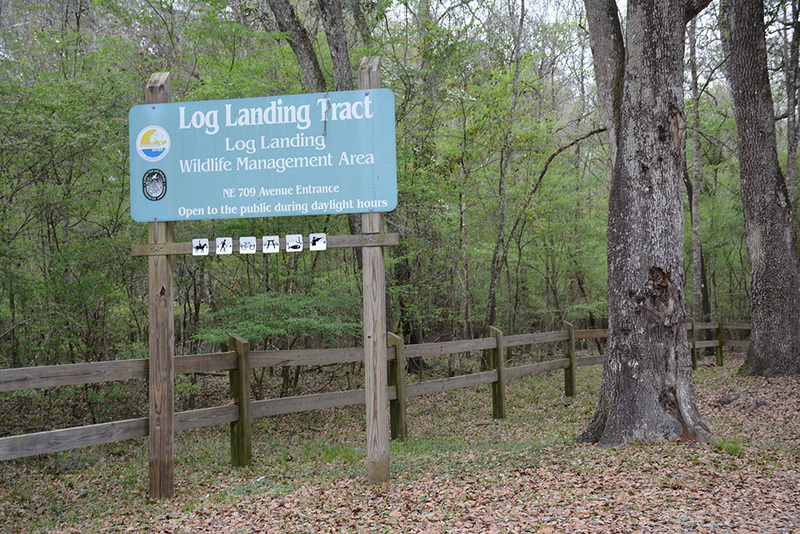 Hunters know about Log Landing since it’s also a wildlife management area, open to hunting during posted hunting seasons. To find Log Landing – and enjoy the lilies while they last – follow CR 349 north from Old Town (or south from Branford) to Log Landing Road. It’s well-marked when you approach from the north, not so much from the south. Log Landing Road takes a few 90-degree bends along its route and eventually becomes a dirt road, but it leads you to the lilies, and the trailhead. There are no facilities. Do these lillies have an aroma? Yes, a mild one. They are in the amaryllis family and are native to our forests.